Sands Macau Casino 22.192175752970694, 113.55497198179364 If you arrive in Macau by ferry from Hong Kong – the impressive bright red Sands Casino sign, logo and hotel tower are probably the first things that catch your eye as you pull into the Outer Harbour Ferry Terminal (at least if it’s dark as you approach). Chapel of St Francis Xavier Religious Site 22.116987791116966, 113.55141927022487 The Chapel of St Francis Xavier stands in the middle of Coloane Village on the southernmost tip of Macau, near to a monument commemorating a victory over pirates in 1910. The Parisian Casino 22.144029347046324, 113.56304559856653 The Parisian is a stunning new Casino on the Cotai Strip – notable in no small part to the half-scale replica of the Eiffel Tower that stands in front of it. City of Dreams Casino 22.149494848907903, 113.5642472282052 City of Dreams is a casino/resort which stands at the bottom of the Cotai Strip directly opposite the Venetian. It incorporates the Hard Rock, Crown Towers and Grand Hyatt hotels (which together make up the four towers surrounding the main casino and retail area – known as the Boulevard). The Venetian Casino 22.14826730324631, 113.56290645897388 The mighty Venetian dominates the lower part of the Cotai strip. Opened in 2007, it is a 39 story themed casino hotel owned by the American Las Vegas Sands company and obviously styled on Venice and Venetian history. Lin Fung Temple Religious Site 22.209996338628848, 113.54799823835492 Lin Fung Temple (Temple of Lotus) is a Buddhist temple built in 1592. It is famous for its history as a stopping off place for Mandarins visiting Macau. Sin Fong Temple Religious Site 22.20652551710601, 113.54592610616237 The Sin Fong Temple is dedicated to General Vanguard (Yang Ye) who was a famous general originally from the Northern Han Dynasty, who now is a deity which protects against aggression. A-Ma Cultural Village Religious Site 22.12300009273681, 113.56287393718958 The A-Ma Cultural Village comprises a large temple complex (Tin Hau temple) and statue to A-Ma which both stand together on a hill top in Coloane. Carmo Fair Historic Site 22.153343824531355, 113.55737913865596 The Taipa market was constructed by the Macau government on 14th September 1886. Panda Pavilion Entertainment 22.12668887120485, 113.5580322984606 The Macau Panda Pavilion sits inside Seac Pai Van Park on the Taipa side of Coloane, nestled between the main road to Coloane and the steep Coloane hillside atop which site the white statue of A-Ma and the Tin Hau Temple. Pak Tai Temple Religious Site 22.152704140840967, 113.5556209506467 The temple is dedicated to Pak Tai (Northern Emperor) who is believed to have the divine power to withstand floods and fire. Our Lady of Penha Church Religious Site 22.186935434771694, 113.53503243997693 Penha church, which is dedicated to ‘Our Lady of Penha of France’ , was constructed in 1622 for the Augustinians. For many years it has served as a shrine for mariners about to embark on dangerous voyages. Our Lady of Carmel Church Religious Site 22.153548771118096, 113.55879668612033 The Church of Our Lady of Carmel stands on a small hill on the edge of old Taipa village, between Carmo Fair and the Taipa Houses museum and the landscaped gardens by the lake. Sam Kai Vui Kun Temple Religious Site 22.193999961824396, 113.53930243290961 Sometimes also known as Kuan Tai Temple – dedicated to Guan Yu, an important general from the Three Kingdoms period who is now worshipped in Taoism and Buddhism. St Augustine's Square Historic Site,Culture 22.192266478914537,113.538111532107 St Augustine’s Square is a traditionally paved small square which lies close to Senado Square. St Augustine's Church Religious Site 22.192241643760376, 113.53829928673804 One of the oldest churches in Macau, the original simple structure was constructed in 1586 by Spanish Augustine priests. Dom Pedro V Theatre Historic Site,Entertainment 22.191852390949926, 113.53832338470966 Dom Pedro V Theatre was one of the first western style theatres in eastern Asia. St Lawrence Church Historic Site,Religious Site 22.19089904491009, 113.53669191012159 Possibly the most richest and most beautiful church in macau, both for its decoration and the objects contained inside it. St. Joseph’s Seminary and Church Religious Site 22.19127621254372, 113.53684951085597 The seminary was established in 1728 followed by the church in 1758. A-Ma Temple Historic Site,Religious Site 22.18614514026043, 113.53118468541652 A-Ma is the oldest and most famous Taoist temple in Macau. Built in 1488 and located close to the coast, it is dedicated to the Ma-tsu, the goddess of sailors and fishermen. Dr Sun Yat-Sen Memorial House Historic Site,Culture 22.199915497410355, 113.54900666512549 This distinctive looking building is a museum where former family members of Sun Yat-Sen (‘the father of modern China’) used to live. Originally known as ‘Mansion of the Sun’, the house was built in 1912 for his first wife, Lu Muzhen. Jao Tsung-I Academy Culture 22.199203425214293, 113.54738120455295 This small academy is dedicated to Professor Jao Tsung-I – a Chinese born Hong Kong scholar, poet, calligrapher and painter who is also referred to a “master of Sinology” and “treasure of the nation”. Tap Seac Gallery Culture 22.198872473968116, 113.54719349183142 This art gallery is hosted in a lovely European style building which lies on Tap Seac Square. Tap Seac Square Culture 22.19810758518602, 113.54714521206915 Tap Seac Square is a major public square in São Lázaro, Macau, China. The largest public space in Macau, it stands on the site of a former stadium and was completed in 2007. Albergue SCM Shopping,Culture 22.197615868768665, 113.5444334987551 Albergue SCM is a small area, tucked away a side street from Tap Seac square, devoted to Macau’s art and cultural industries. Vasco Da Gama Garden Garden 22.19623077290253, 113.54664359707385 This small garden was built at the end of the 19th Century. Lou Lim Ieoc Garden Garden 22.199999932302383, 113.54753413237631 Built in 1906 by local merchant Lou Kau as part of his residence, its design follows the well-known Suzhou Gardens. Na Tcha Temple Historic Site,Religious Site 22.197734820684556, 113.54062738129869 Built in 1888, this is a Chinese folk religion temple dedicated to the worship of the deity Na Tcha. St Dominic's Church Religious Site 22.194586722626678, 113.54037527460605 Established in 1587 by 3 Spanish Dominican priests who arrived in Macau from Acapulco, Mexico, this church has been the scene of several violent incidents. Macao Museum Historic Site 22.197218520910848,113.5423091892153 The museum details the history of Macau and is built on the site where the former Meteorological Service was located. Holy House of Mercy Historic Site 22.193742338871083, 113.54016338009387 It was a medical clinic and several other social welfare structures in early Macau. Monte Fort Historic Site 22.19720726787898,113.54207592085004 Monte Fort, or the ‘Fortress of Our Lady of the Mount of St. Paul’ is the historical military centre of Macau. Leal Senado Historic Site 22.193371386599146, 113.53957394370809 Overlooking Senado Square, this building was the seat of the Portuguese government in Macau. Casino Lisboa Casino 22.189301790165306, 113.54459438938648 The original casino in Macau was built in the late 1960s by Stanley Ho and acquaintances. Grand Lisboa Casino Casino 22.18936935094934, 113.54418413713574 Located in the heart of Macau, this stunning building in the shape of a golden lotus leaf dominates the local skyline. Wynn Macau Casino Casino 22.187916301855005,113.5464695468545 Owned by Wynn Resorts, their casino opened to the public in 2006 (after the monoploy of Stanley Ho’s company STDM came to an end in 2000). 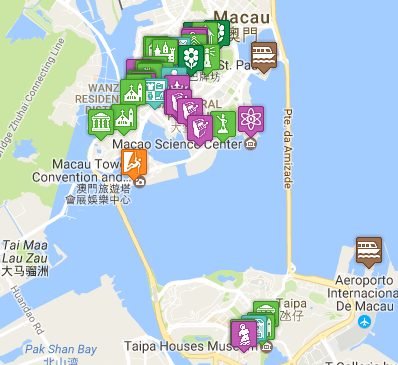 MGM Macu Casino 22.18515452028256,113.54818616062403 The MGM Grand stands on the Avenida Dr Sun Yat Sen, the long road running alongside the Outer Harbour, linking the Ferry Terminal to the Macau Tower. Its distinctive 3-tier design forms part of the wonderful cityscape you can see from the Ferry, or the Taipa bridges. Macau Tower Shopping,Food & Drink,Entertainment 22.1797327827576, 113.53677587583661 Standing proud between Sai Van Lake and the South China Sea, the Macau Tower is a great destination for adventure, entertainment or just a stroll along the sea front. Kun Iam Statue Religious Site 22.18583006899218, 113.55208072811365 The beatiful gold statue of Kun Yam stands on a small island jutting into the Outer Harbour between Macau and Taipa, along Avenida Dr. Sun Yat-Sen.
Guia Fort & Lighthouse Historic Site 22.196482415511966, 113.54933934286237 This 17th Century military fort stands atop Guia Hill – the highest point in Macau. Now surrounded by a park, it encompasses a fort, chapel and lighthouse complex. Ruins of St. Paul's Historic Site,Religious Site 22.19751172027873, 113.54089030064642 One of the most recognisable landmarks in Macau, the ruins are all that remains of a 16th century complex which included the Church of St Paul (Mater Dei) and St Paul’s College. Senado Square Historic Site 22.1936703952778, 113.5399876954034 Senado square (Largo do Senado, 議事亭前地) is a beautiful paved square in historic downtown Macau. The Portuguese influence is everywhere here, with beautiful old pastel coloured buildings surrounding it, giving it something of a Mediterranean feeling.